On Saturday, June 8th, beginning at 6:30 PM, we will look back to how it all began. We will review the church's history with our founding pastor, Dr. John Wilson, and enjoy pictures and testimonies from 5 decades of God's faithfulness. On Sunday, June 9th, we will celebrate how God has fulfilled the early visions of the church, hear from special guest speaker Dr. Greg Mundis, executive Director of Assemblies of God World Missions, and look forward to the next 50 years. Be sure to mark your calendars. You wont want to miss any of it! A 50th Retrospective Event hosted by Dr. John Wilson. A Celebration Service hosted by Pastor Jared Stoner (current Lead Pastor) with keynote speaker, Dr. Greg Mundis. Lite refreshments and fellowship to follow both events in the church foyer. We have a special block of rooms reserved at a discounted rate. 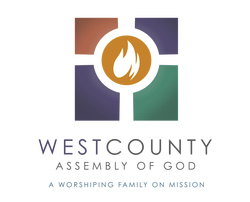 Please call and mention West County Assembly of God to get the special rate. Deadline for this rate is May 23. Hotel is located across the road from WCAG.